St. John Vianney, Adorer of the Blessed Sacrament holy Priest of Ars, you had such an overwhelming love for Christ in the Blessed Sacrament that you prayed for hours in His presence. You said that when our Lord sees them coming eagerly to visit Him in the Blessed Sacrament, He smiles upon them. They come with that simplicity which pleases Him so much. 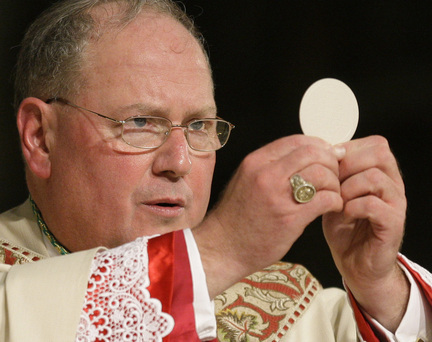 O Saint of the Eucharist, may your example enkindle in Cardinal Dolan a deeper love for Jesus in the Blessed Sacrament. By your prayers, never let him doubt Christ’s Real Presence, but obtain for him a firm faith rooted in the Eucharist. Help him not to be afraid to defend or preach Christ’s Real Presence in the Blessed Sacrament. Obtain for him the grace to approach our Lord with simplicity of heart as he lays his soul’s innermost thoughts before Jesus’ Sacred Heart. Keep Cardinal Dolan under your continual protection, that he may be supported by your example and assistance and be faithfully devoted to Christ in the Blessed Sacrament. May his life reflect the belief of our Lord’s abiding presence with us. O St. John Vianney, by the power of your intercession, give us Priests devoted to the holy Sacrament of the Altar. Novena Prayer: O holy Priest of Ars, St. John Marie Vianney, you loved God and served Him faithfully as His Priest. Now you see God face to face in heaven. You never despaired but persevered in your faith until you died. Remember now the dangers, fears and anxieties that surround Cardinal Dolan and intercede for him in all his needs and troubles especially console him in his most difficult moments, grant him serenity in the midst of crisis, and protect him from evil. O St. John Vianney, I have confidence in your intercession. Pray for Cardinal Dolan in a special way during this novena.